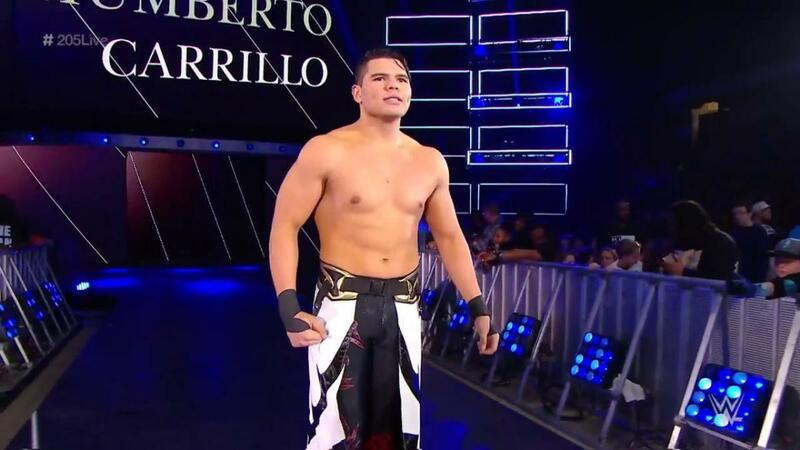 Humberto Carrillo is the latest WWE call-up, joining the 205 Live roster. After TJP backstage tried to answer Buddy Murphy’s open challenge, 205 Live GM Drake Maverick told TJP that the open challenge had already been accepted. Carrillo came out after Murphy cut a promo about his match at the Royal Rumble. The two had a back and forth competitve match. At one point, Murphy feigned a knee injury. Carrillo took his guard down as turned his back to Murphy, who was being attended to by referees. Murphy jumped him, but Carillo cut him off, at one point sending Murphy over the announce table. The cruiserweight champion was able to cut him off, however, and pinned him with Murphy’s law. Carrillo is best known for his run in Mexico under a mask as Ultimo Ninja, wrestling for the Crash and other independent promotions in Mexico since his debut in 2012. He signed with WWE and made his NXT debut back in August without a mask. He’s been used on NXT television mostly as enhancement talent, sometimes teaming with Raul Mendoza. His name was listed among other 205 Live names as part of WWE's Worlds Collide tournament that will take place during the Royal Rumble Axxess event starting on January 26. It was later removed, with WWE listing "a superstar to be named" in his place.